If you have any of the following recordings and are willing to trade for it, please get in touch with me, gladcarrot@gmail.com I essentially have all of the other recordings listed on this site. This list is only of shows that I have seen listed on trading site, bootlegs lists or on forums. No doubt uncirculated recordings exists for nearly every show. Both of these shows are extremely rare and out of circulation. Here are two claims. Both have bee contacted without response. There are a several bootlegs that contain the Bowie portion of the Outside Tour show along with the combined portion of the show. 1995-09-23 Burgettstown, PA Coca-Cola Star Lake Amp. - audio of Bowie "A Mind Warp Pavillion"
1995-10-03 Auburn Hills, MI Palace Of Auburn Hills -audio of Bowie "Detroit 95"
1995-10-09 Atlanta, GA Coca-Cola Lakewood Amp. - audio of Bowie, incomplete "Deranged Pigs"
1995-10-16 Denver, CO McNichol's Arena -audio of Bowie "They're Winning Next Door"
1995-10-24 Tacoma, WA Tacoma Dome -audio of Bowie, "Inside the Dome"
1995-10-28 Inglewood, CA The Great Western Forum - audio of Bowie, part 1 on "They Beat Us on the Outside" , part 2 on "Inside the Dome"
- Surprisingly this hasn't surfaced yet. I mean come on, IT WAS ON TV. There were even VCRs in 1990. Somebody somewhere has this episode sitting in a box of VHS tapes in their basement and doesn't even know it. 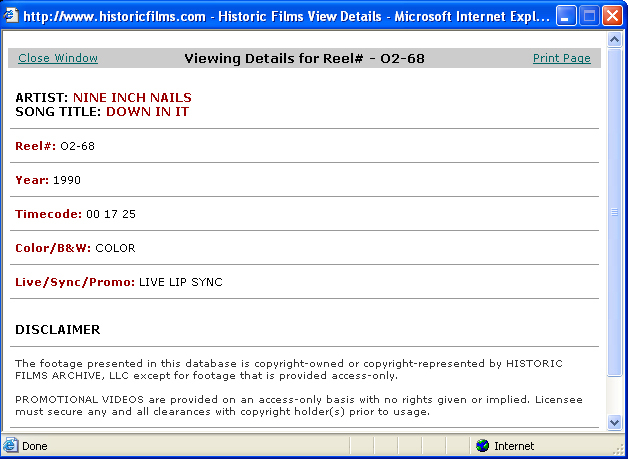 You can buy it if you want for several thousand dollars from historicfilms.com if you are using it for educational purposes, like a documentary. I'm sure you'd have to sign a license so it doesn't end up on YouTube or Demonoid.